How can we respond to the recent surge in intolerance, hatred, and isolationism in the world with brotherhood and sisterhood, our feet rooted firmly in the Earth and our minds free from judgment and anger? Young people (16-35 year olds) from around Europe and the world are warmly invited to gather in Plum Village for a joyful and transformative week, from the 10th to the 17th of August 2018, to explore our connection to the Earth in this international Wake Up Retreat. 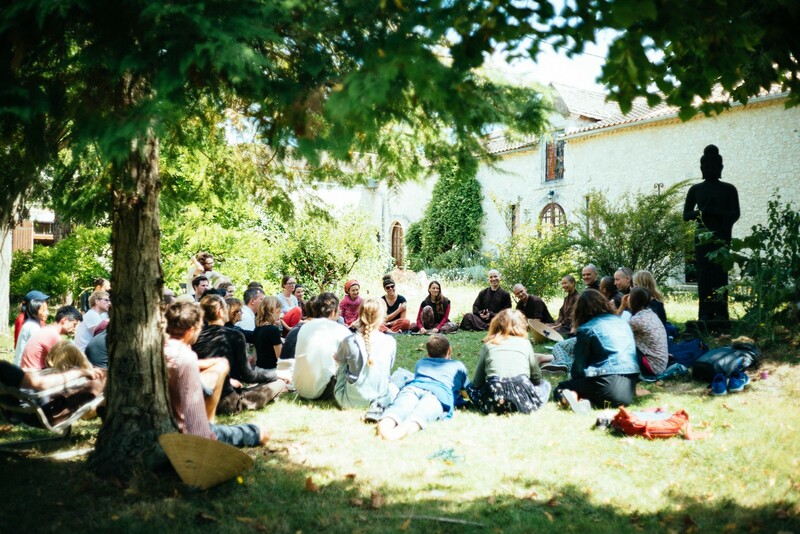 The retreat is a chance to exchange insights and discover deep mindfulness practices together as we reflect on how to live sustainably in freedom and happiness on our Mother Earth. Together we realize how collective awakening can bring about true healing and transformation for ourselves and others. In addition to sitting meditation, Dharma talks and mindful eating, we’ll have plenty of time to relax and restore ourselves by being close to nature—enjoying walking meditations in the forest, going on hikes, working on the organic Happy Farm, and spending time together around the fire. There will be music and laughter, as well as time to listen deeply and share from our hearts. This retreat is only for young adults aged 35 and younger. We have retreats for all ages throughout the rest of the year. If you know young people who may be interested in the retreat, please encourage them to register.